Unity Intercom 3 Server and Client are now available. Unity 3 is a powerful, all new version of Unity. Current Unity customers can upgrade for only $99. When upgrading to Unity 3 any additional licenses you have already purchased will still be valid. Note: Installing Unity 3 will activate a 14 day trial period. To upgrade to Unity 3 simply download the current version of Unity Intercom which will automatically override and upgrade your existing Unity to version 3. All settings and licenses will remain the same. You must purchase an upgrade license or Unity 3 will expire after 7 days. Customers who have recently purchased Unity may quality for a free upgrade. Click Here for more details. Before upgrading it is a good idea to do a backup by selecting "Save Configuration" from the Unity drop down menu. Note: Downloading Unity 3 Server will override any previous versions and will begin the trial period. Unity 3 is considered a full version upgrade. Existing Unity customers that install Unity 3 must purchase an upgrade license to continue using Unity. Upgrading to Unity 3 is not required for existing Unity customers but all new features and enhancements will be added exclusively to the Unity 3 platform. Unity 3 is now the current Unity version and available on the Download Page Here. 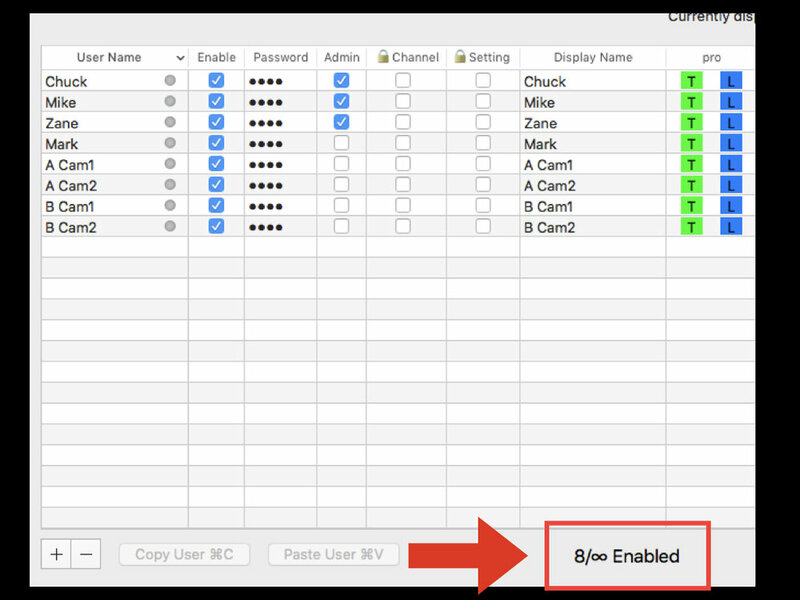 Instead of having 6 party line channels appearing as 1-6 you can now create channel labels. Labels make it easier to clearly understand the purpose of each channel at a glance. In addition it's very helpful to see the yellow activity indicator above a particular channel and know exactly what type of communication you are hearing. Channel label abbreviations are created in the "Channels" page in the Unity Server. With the purchase of the Expanded Channels and Groups license in Unity 3 you can now create up to 128 different party line channels in your Unity Server. Those channels can be assigned into "Groups". Each group is made up of 6 channels that you select. Users will still only have access to 6 channels at a time per group but will have up to 128 individual party line channels available throughout different groups. Channels are created in the Channels page on the Unity Server. With the purchase of the Expanded Channels and Groups license you can now create different groups and assign users to those groups. Each group is comprised of 6 channels that you create and assign. Groups can share common channels with other groups or can be made up of unique channels and be completely separate from other groups. Users who have been given access to more than one group can switch between groups by tapping the arrows at the bottom of the Client app. This is very helpful for instance when you have channels receiving loud audio making it difficult to hear communications from one or more important channels. Users can now press and hold directly on a party line Talk channel to "Solo" that channel which means you are talking only on that channel. This is very helpful when you have multiple activated Talk channels but need to communicate something on just one particular channel. Rather than having to deactivate other Talk channels you can simply press on a channel to directly talk down that channel. Simply by swiping right users can access the main "Settings" page or by tapping the Settings link in the upper left. Swiping left now brings up the "Users" page or by tapping the Users link in the upper right. Volume is a separate page that now contains all the audio volumes and ducking levels. You can quickly access this page by swiping up or by tapping the Volume link at the bottom of the app. This is also where you will go to select "Program Feeds". Users can scroll quickly through the available program feeds and select them with one tap. Please call or email for details. A Unity Max license removes the 63 user limit. With a Unity Max license you can create as many users as you want and have them all enabled. This eliminates the need to enable and disable users based on the number of licenses you have. Some caution is advised as each Mac server computer will have limits as to how much it can process. Macs running large numbers of active users could experience issues and limits should be tested. Hard-wired clients can now enable settings which deliver ultra-low latency. This is very close to traditional hardwired comm speeds. This setting is useful for low latency in-studio communications.